Originally, the water was carried in lead pipes buried underground, but they regularly sprang leaks and had to be dug up, so local people came up with a novel idea, building a labyrinth of stone-lined, vaulted tunnels to house the pipes. These tunnels – now known as ‘the underground passages’ – allowed quick, direct access below ground for the plumbers to carry out repairs. Professor Stoyle says: “The tunnels gave maintenance access to the pipes which was way ahead of its time – providing the kind of opportunity to quickly mend a fault that modern utility companies can only dream of. Imagine if today there was no more digging up the roads to mend a water main! Professor Stoyle has examined hundreds of original documents relating to the plumbers’ activities, including accounts detailing payments for supplies like lead, candles and lanterns. He has also discovered a mass of evidence about the individual craftsmen who worked to keep the city fountains flowing. John Date, for example, was the first plumber known to have worked on the main city aqueduct, and was employed during the 1420s, while William Frost came down to Exeter from London in the 1440s to upgrade the city system. The city accounts provide a detailed picture of the work Frost carried out on the pipes, showing that he and his colleague John Were were provided with regular meals at the city’s expense. The city’s most prominent plumber during the Tudor period was Nicholas Walrond, who oversaw the pipes for more than 30 years from the 1520s. Walrond witnessed two major historical events; the old monastic aqueducts passing into lay hands as a result of Henry VIII’s dissolution of the monasteries and the devastation caused by the Prayer Book Rebellion of 1549 – when Exeter was besieged by the rebels for over a month, the pipes were dug up and their lead was melted down by the insurgents for ammunition. This meant major repairs for Walrond once the emergency was over. 'Nicholas Plumber', as Walrond was usually known, was still working on the aqueducts as late as the 1560s, by which time he was a relatively old man. Professor Stoyle has recovered the stories of countless other characters whose lives intersected with Exeter’s aqueducts and underground passages over the years. For example, Richard and John Deymond were two stone masons who carved a splendid figure of Queen Elizabeth I, which was set up on one of the city's public fountains in the 1590s and which still survives today – having narrowly escaped destruction during the Blitz of World War Two. An altogether more alarming figure was Dr William Cox, one of the cathedral canons, who – during the English Civil War – was accused of plotting to blow up the city with gunpowder laid in the passage vaults. 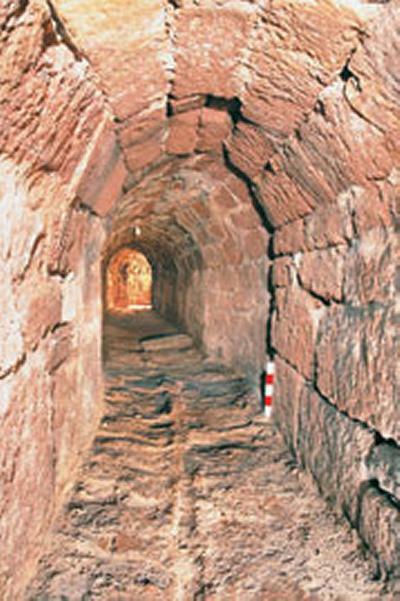 To learn more about these unique tunnels, please see Professor Mark Stoyle’s new book, Water in the City: The Aqueducts and Underground Passages of Exeter published by University of Exeter Press. Further information about the book can be found here.